Little Red Devil: Rufous Hummingbird /Hawks Aloft Inc.
All seems to be at peace in the world of the tiniest of birds, each seemingly willing to share the bounty provided by our feeders. 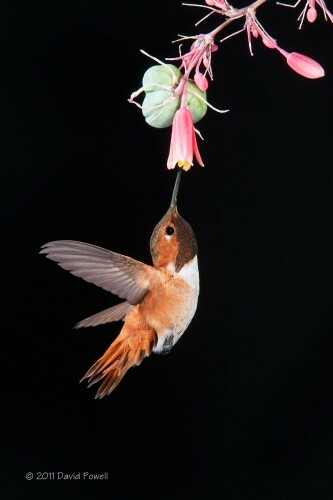 However, long about the Fourth of July, the little red devil arrives, the Rufous Hummingbird, fascinatingly ferocious! He has a well-deserved reputation as the feistiest hummingbird in North America. The brilliant orange male is a relentless attacker at flowers and feeders. He will sit and wait for an unsuspecting victim to attempt to feed and then attack with an accompanying ticking sound! The little males then retreat to a guard post to watch for any other intruders. However, at dawn and dusk when other hummies are tanking up, they become overwhelmed by the sheer number of other hummingbirds. I recently watched two male Rufous Hummers feeding along with 4 others at my 6 port feeder in the early morning. Rufous Hummingbirds are wide-ranging, and breed farther north than any other hummingbird. Look for them in spring in California, summer in the Pacific Northwest and Alaska, and fall in the Rocky Mountains as they make their annual circuit of the West.